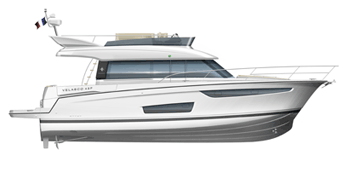 In March, the Sun Fast 3300 sailed at sea for the first time from the port of La Rochelle. A true race boat, the new Sun Fast 3300 has a sail plan tailored for performance. Daniel Andrieu and Guillaume Verdier, the two naval architects of this new sailboat, will speak in more detail in a short video. "30 years ago, the lateral rigging was on the centreline, that is to say, perpendicular to the mast, and only served to stabilise the mast from side to side. All the fore and aft stability was maintained by the backstays, the upper and lower runners and by the tension that these created with the forestay. Here, we retain a configuration where the lateral rigging is a swept-back spreader design that supports the mast no matter what. The backstays and runners simply help to add tension to the forestay and to increase, a bit, the bend of the mast. This is not controlling the entire rigging system, which is done by the backstay. We seek a homogenous boat, then, and having created this hull, we find ourselves seeking balanced tensions. On pushing the rigging back a bit, we find ourselves in a virtuous circle, since the roach of the main sail is greater. We find ourselves with a mainsail that is more rectangular, while before it was more triangular. For example, when we take in a reef, the rectangle affords a greater roach than the triangle. It is thus purely geometric."